Finding the right cycling gear, including jerseys, is important to being comfortable while riding. Unlike your normal clothing, a lot more goes into finding the right men’s cycling jersey. From finding the correct sizing, to determining the fit you’re looking for, getting a cycling jersey can be hard. We aim to make it easier with some helpful information on everything you need to pick the right one. As always, some of the most helpful advice you can get will come from a stop at your local pro shop. Experienced cycling professionals can help you find the right clothing and gear for your needs. How do you choose the right men’s cycling jersey? When choosing a biking jersey, it all comes down to size. Every manufacturer has their specified sizing chart that can help you choose that cool biking jersey. Like a suit, finding a jersey means taking measurements of specifics like arm length and chest width. While measurements are important, they are also only one part of the puzzle. Another factor to consider when choosing your jersey is the style you would like. Are you looking for a loose fitting jersey? Do you want a tighter jersey like the riders on the Tour de France? This will all come down to comfort. There are loose fit, pro sizes, and race fit, which all come with their level of tailoring. A pro fit for example can be tighter than a loose fit, but is still not as tailored as the race fit jersey. Like clothes, it is best to go to your local pro shop and try on some jerseys before purchasing your first one. Finally, the style is another way to choose the right men’s cycling jersey. Everyone wants a cool biking jersey with all the different pro logos and intricate designs, but for others, a clean and minimalistic look might be better. Choosing the “right” jersey comes down to personal preference. Be on the lookout for discount cycling clothes as some of the more exotic looking jersey designs can actually be the best-priced gear. Why are cycling clothes better? Better Fit: Cycling clothes are designed for biking and offer plenty of design features that are specific to the bike. For example, cycling jerseys are designed with longer backs to help keep your back covered as you lean over the handlebars. Sweat Resistance: Cycling is a very cardio intensive sport, and will have you sweating in no time. Run of the mill clothing will collect sweat, which can make you uncomfortable. 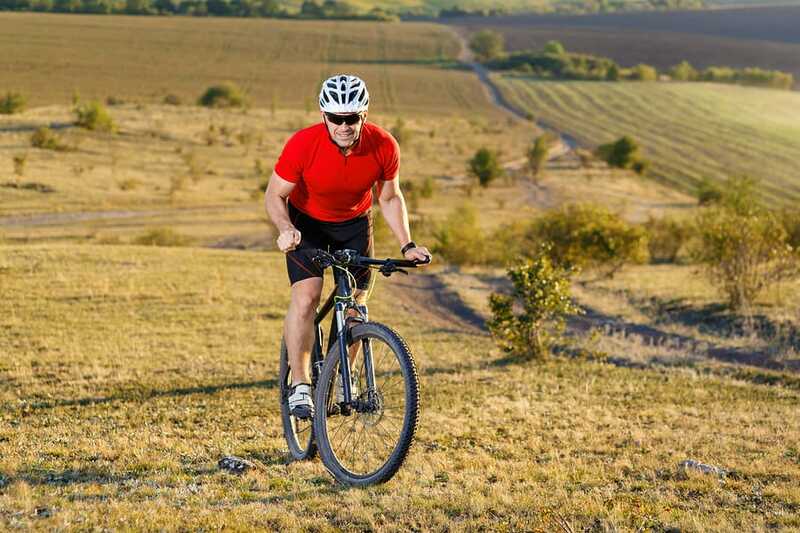 Cycling clothes is breathable and helps to wick away sweat and keep you cool and refreshed as you ride. Padding: More important than anything else, cycling clothes has padding. If you are road biking, chances are you are putting in some heavy miles. Without any padding on the saddle, this can create discomfort and even pain. Most cycling shorts come equipped with built in pads to help absorb some of that discomfort. Versatility: There are so many options that stem from cycling clothes. You can choose between full bibs, long sleeve cycle jerseys, gloves, and even jackets. Because of all these options you can customize your wardrobe according to your ride and location. Weather Resistance: Cycling clothing can be purchased according to the weather you ride in as well. Some jerseys are water resistant, which can help with the rain. Other clothing is designed to trap heat and keep you warm even in the coldest areas. Check your weather before purchasing your clothes to make sure you get the right gear. Once you choose your clothing, there is a good chance you’ll be looking for discount cycling gear. Before you order discount jerseys from overseas, take the time to do you research and get the right fit for you. In some instances, prices that may seem too good to be true are, and it’s important to avoid bad purchases when looking for discount cycling gear. Once you’ve picked your cool biking jersey, and the rest of your ensemble, you’re ready to hit the road. Before riding, be sure to have extra clothing in case of accidents, or adjustments for inclement weather like a long sleeve cycle jersey. You should also consider the time you are riding and use highly visible clothing if riding at night. When making your purchases for cycling clothes, be sure to look out for discount cycling gear. In a lot of situations, you can find great deals on gear especially when buying the “stranger” looking kits. From superhero logos, to human anatomy, there are plenty of cool cycling clothes to stand apart in your peloton.